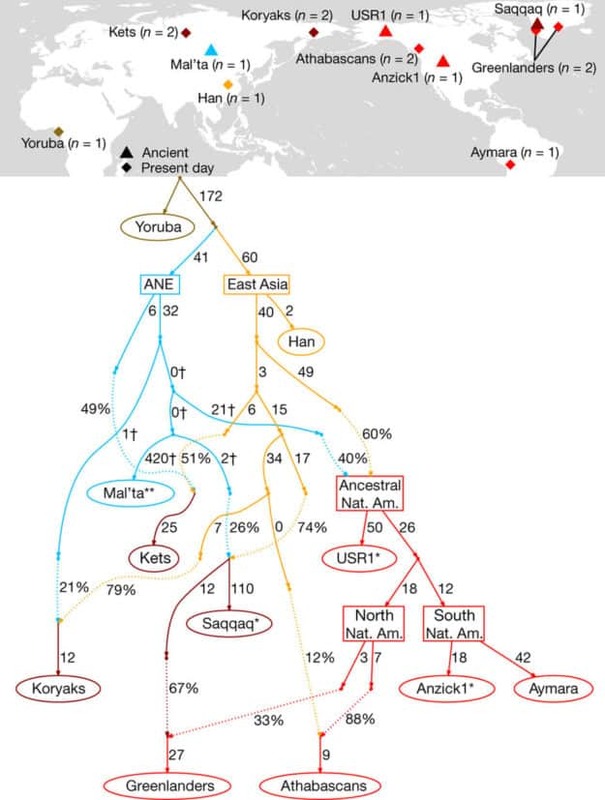 As you probably know a new ancient genome paper was published last week in Nature, Terminal Pleistocene Alaskan genome reveals first founding population of Native Americans. There is at least one other involving Willerslev in the works for what it’s worth. Carl Zimmer has a good write-up in The New York Times, while Greg Cochran picked up the fact that the latest results show no evidence of “Australo-Melanesian” affinities that have been found in Amazonians. The key issue here is that they found 11,500 year old remains from Alaska, one of which they sequenced at 17x coverage, which is rather good (not medical grade good, but really sufficient for a lot of population genomic work). It’s clear that the lineage represented by these remains is “basal” to that of other Native American peoples, whom David Reich’s group labeled “First Americans.” Later, the First Americans diverged into different populations, with the two in modern focus being a northern cluster, including the Aboriginal peoples of Canada and parts of the United States, and a southern one including everyone else. This does not mean that the Beringians were isolated outliers. There may have been many other peoples related to the Beringians who diversified, who went extinct as well. The settlement of Alaska by other peoples suggests to me that extreme conditions in the Arctic made it likely that there would be population turnover there. Also, the fact that these samples were located close to the source of settlement in the New World by modern humans makes their distant relation to all other New World populations unsurprising. The big thing that the press is highlighting is the confirmation of the Beringian Standstill model, where modern humans percolated into the area between Siberia and Alaska, Beringia, and did not move east for thousands of years. Basically, the conditions were inclement toward human habitation on both sides of Beringia, while a relict modern human group likely occupied a pocket of more moderate climes for thousands of years, with minimal gene flow from the west, and blocked from migration to the east. Genetically the Beringia Standstill made sense for a long time…the divergence between Amerindian lineages and those of eastern Eurasia seemed too old to be accounted for by recent migration a bit more than 10,000 years ago (the old “Clovis first” hypothesis). One aspect here I want to emphasize is that our image of a world thickly populated with humans may mislead us in our intuition about how patchy occupation was ~25,000 years ago. Yes, humans may have left artifacts all over the world, but that doesn’t mean that there weren’t centuries or millennia of no occupation, or, that meta-population dynamics were such that extinctions were common. For decades in population genetics there has been talk of “clines vs. clusters,” but if human population densities were far lower, or occupation patchier, then clines may have become much more important recently with high density than in the past. Finally, back to the Australo-Melanesian issue. Either there is a lot of population structure in ancient Beringia to be explored, with diverse quasi-Asiatic groups, or there was an Australo-Melanesian group already in South America. * Ancient North Eurasian ancestry came into Beringians ~20,000 years ago. Two groups which merged during the middle of the Last Glacial Maximum.